“Godzilla,” which is rated “PG-13” and opens on May 16, 2014, also stars Bryan Cranston, Sally Hawkins, Juliette Binoche, David Strathairn, Ken Watanabe, Patrick Sabongui, Victor Rasuk, Richard T. Jones, Carson Bolde and CJ Adams from visionary new director Gareth Edwards and writers Max Borenstein and Dave Callaham. To win your free “Godzilla” passes courtesy of HollywoodChicago.com, just get interactive with our social media widget below. That’s it! This screening is on Monday, May 12, 2014 at 7 p.m. in downtown Chicago. The more social actions you complete, the more points you score and the higher yours odds of winning! Completing these social actions only increases your odds of winning; this doesn’t intensify your competition! The world’s most revered monster is reborn as Warner Bros. Pictures and Legendary Pictures unleash the epic action adventure “Godzilla”. From visionary new director Gareth Edwards (“Monsters”) comes a powerful story of human courage and reconciliation in the face of titanic forces of nature when the awe-inspiring Godzilla rises to restore balance as humanity stands defenseless. 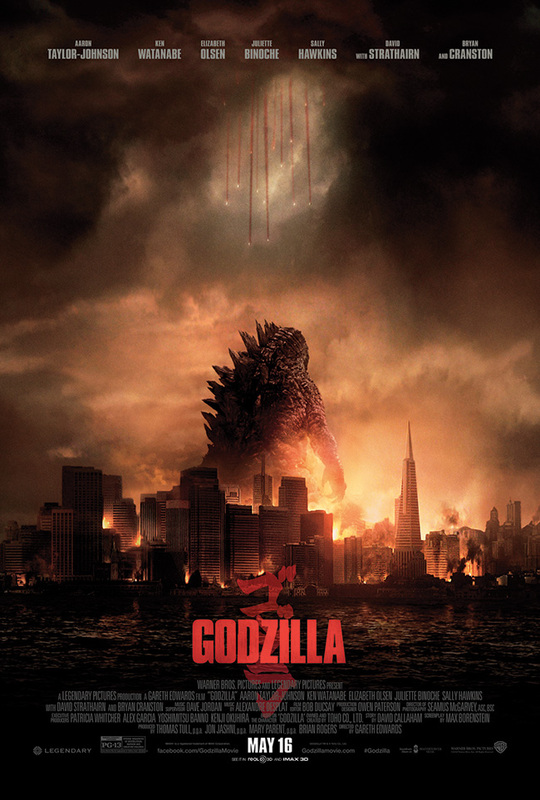 The movie poster for “Godzilla” starring Elizabeth Olsen and Aaron Taylor-Johnson. This HollywoodChicago.com Hookup is simple! Just get interactive in our unique Hookup technology above. We will award 20 admit-two movie tickets based on social entry numbers and/or randomly via e-mail for our “Godzilla” Hookup. Good luck!